I grew up eating chorizo in Mexico, and I love it. It comes in deep-burnt-reddish links of fresh, moist, exotically seasoned ground meat, that once, fried, becomes crisp and filling bites with bold flavors and a thousand uses. When I moved to the United States, more than a dozen years ago, I was thrilled to find chorizo in international grocery stores. Lately, I have been intrigued and surprised to see that my Mexican chorizo is now accompanied by many other kinds in the refrigerated sections of bigger, more mainstream stores. Latin chorizos differ greatly from Spanish ones. 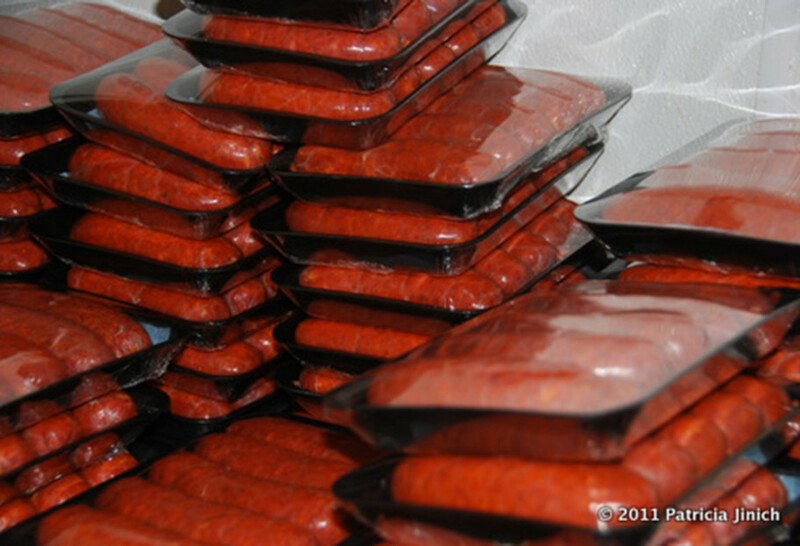 Spanish chorizos typically are dried and smoked cured links of chopped meat, seasoned mainly with garlic and paprika; they tend to be ready to eat and have a salami-like soft and chewy bite. Latin ones however, are raw and need to be cooked before eating. Mexican is the spiciest of all the Latin chorizos, and I won’t deny that it’s my favorite. Mexican chorizos can have variations as well, but they generally contain dried chile peppers like ancho, pasilla, guajillo and/or chipotles; a mix of spices that might include oregano, cumin, thyme, marhoram, bay leaves, cinnamon, coriander seeds, allspice, paprika, achiote and cloves; most times garlic and sometimes onion, and always vinegar, which makes the meat flake or crumble as it brown and give it a welcome hint of acidity. Toluca, a city in Mexico known as The Chorizo Capital, also has a delicious Green Chorizo. That has green fresh chiles and herbs in the mix. For different ways to try use chorizo, check out the ideas and recipes, like the Mexican style pasta below, on my chorizo episode. And if you feel like making your own Mexican chorizo, you may want to give Mrs.Wheelbarrow’s recipe a try. Can’t find chicken ala trash on your website. I am sure my teenage grandson would love it. It seems easy, since I am getting old I appreciate one pot dishes. Ha ha. Love your show. Thank you!! How about a recipe for making chorizo. Yes I am so happy. Mrs. Wheelbarrows is a great book and I am glad you have read it.! Hi Pati I love your show and I love the food of your country! I live in New England and the only way I can get Mexican chorizo is by having a friend in California freeze it and send it to me. The only chorizo that I can find in the stores including international supermarkets is Portuguese chorizo. I have tried making my own but it’s just not the same, any tips? Hola Ellinda, thank you for the request! I will be sure to post one soon. Mexico.We Have tried to make ,but to no avale it doesnt turn out good . Love your show! Hola Bryan, Thank you for commenting! I do have some recipes and will try to post as soon as possible.